Who says that kids are not watching us and mimicking our moves? Phillip identifies himself by referring to Phil. Looking to his grandfather, he knows who he is and who he is not. Yesterday St. Joe’s lost to UConn, but the “coaches” are still enjoying their right relationship. The “Invitation to Communion” has previously been the topic of a homily in church and a post on this blog. But its beauty astounded us again today, as we heard an extraordinary scripture passage at Mass. As Jesus walks by, there is an acclamation by John the Baptist: “Behold the Lamb of God.” Two of John’s disciples follow Jesus. One is Andrew. The other is not named, which leaves room for you to be the other disciple. There is an acclamation: “Behold the Lamb of God.” Something stirs within them. They approach Jesus. He asks them a question. They ask their own, “Where do you stay?” In response Jesus offers them an invitation – “Come …” – and gives them a promise – “… and you will see.” And they stay with him that day. Acclamation, question, invitation, promise – and communion. At Mass we hear the acclamation, “Behold the Lamb of God.” When you hear that, something stirs within you. As you walk up the aisle toward the altar for communion, Jesus asks you what you are looking for. You approach him with your question or your wonderment, whatever question or wonderment you have about yourself or about life. Jesus gives you an invitation, “Come. Come to me in the consecrated bread and wine.” And he makes you a promise, “You will see.” You will get an answer. It might not be clear now. It may take some time. But he does promise, “Stay with me. You will see. There will come the time when all your questions are answered, when you will wonder no more. Stay with me. You will see.” Then the most extraordinary of things happens. We receive communion, or better, we are received into communion. He asks us to stay with him, and he asks to stay with us. It is communion – “holy” communion. At his first coming at Bethlehem, shepherds and kings stood in line to adore him. In Galilee, the sick and the unworthy stood in line to see Jesus, hoping that he would touch them with some healing or some hope. Where is the line to see Jesus now? Is it a line in which you can see Jesus? Last Sunday there was a line of people standing in the sanctuary of our parish church to take a tag off the “Giving Tree.” A line to see Jesus? Sometime this week those people will stand in a line of another kind, as they purchase the gifts? A line in which to see Jesus? Next Sunday they will stand in line again in church, as they bring their wrapped offerings and lay them at the altar. A line to see Jesus? And after the last Mass, after all the gifts are sorted according to family units, there will be another line at church: people standing in line to receive the gifts and take them home, so that they and their children will celebrate Christmas with a gift. A line in which to see Jesus? At the end of the homily on Sunday, I asked all present at Mass: What is the next line in which you will stand? All of you, together, standing in line? Before leaving this church building? In about 12 minutes? Right after the priest holds up the consecrated bread and wine? Right after that “Behold the Lamb of God. Behold him who takes away the sins of the world. 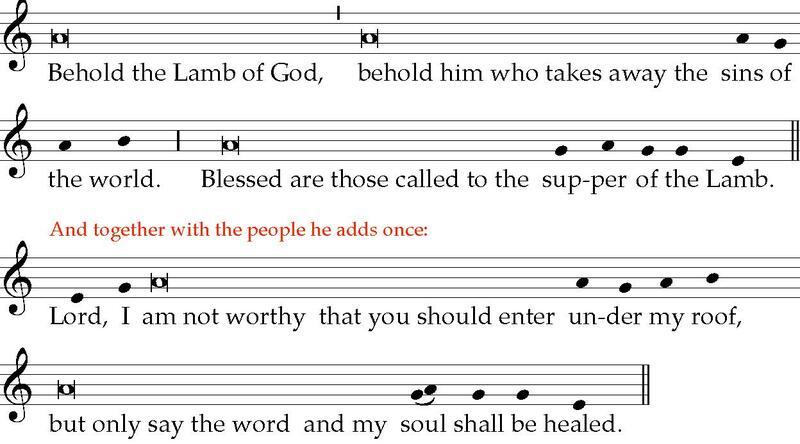 Blessed are those called to the Supper of the Lamb? Lord, I am not worthy that you should come under my roof, but only say the word and my soul shall be healed” – right after that invitation and preparation? The Body of Christ. Amen. The Blood of Christ. Amen. It is an invitation to communion. As we approach the altar for communion, we are Andrew. We are the bride. We are the centurion. It is an invitation to communion – holy communion! Behold the Lamb of God – The next day he saw Jesus coming toward him and said, “Behold, the Lamb of God, who takes away the sin of the world. (John 1:29) – As Jesus approached, John the Baptist pointed him out to two of his disciples as “the Lamb of God,” the one whom the people were waiting for, the one who would be sacrificed for their sake. Andrew, “our” Andrew, was one of the two who heard John and followed Jesus. The other one is not named. Jesus invites them to come and see where he is staying. They went and saw where he was staying, and they stayed with him that day. 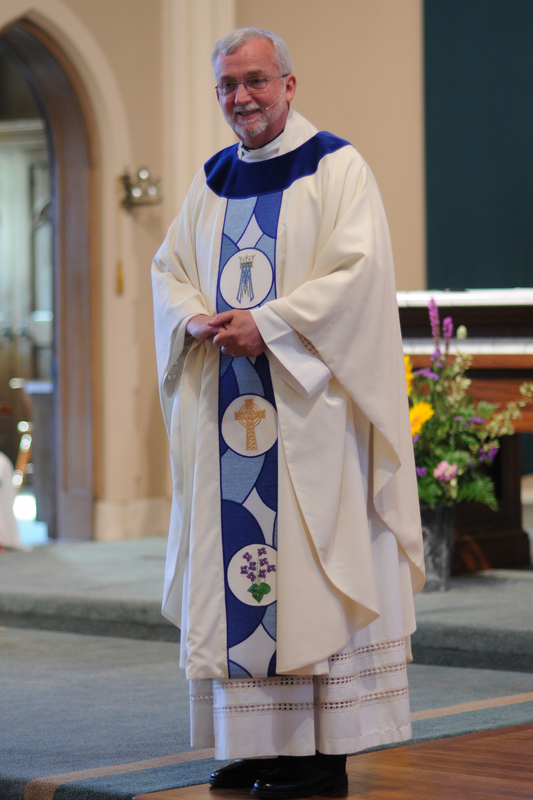 At communion we are that unnamed disciple, with our Andrew. Jesus is pointed out, held up as the “Lamb of God.” We choose to follow. Jesus gives us the same invitation he gave to Andrew, “Stay with me.” In the company of Andrew in the company of Jesus – that is holy communion. The supper of the Lamb – Then the angel said to me, “Write this: Blessed are those who have been called to the wedding feast of the Lamb.” (Revelation 19:9) – In the last book of the Bible there is a description of the feast in heaven. It is a wedding feast. The Lamb of God is the groom. His bride, his beloved, is the Church, the believers, the baptized, all those who have been washed in the blood of the Lamb. The Mass is a taste of heaven. There is a taste of Cincinnati, a taste of Milford, a taste of Clermont County. The Mass is a taste of heaven. The Mass is a wedding feast. As we approach the altar for communion, we are the bride walking up the aisle. Jesus is the groom, at the altar, on the altar, waiting for his bride to come up the aisle, longing to be joined in intimate communion. Under my roof – The centurion said in reply, “Lord, I am not worthy to have you enter under my roof; only say the word and my servant will be healed.” (Matthew 8:8) – The centurion, as a military man with a hundred soldiers under his command, knew authority. As a Roman soldier, as an enforcer of the occupying foreign power, he was despised by the people. But his servant is sick at his house. Knowing he was not worthy to have Jesus come to his house, he asked Jesus just to say the word, knowing that Jesus had authority that he could never have, no matter how much he would ever be promoted. Jesus says the word, and his first long distance healing happens. In our unworthiness and sinfulness, we approach Jesus for communion and healing. We are flawed. We fret that we are not worthy to have Jesus enter our home. But Jesus says the word, and comes into our house, into our home, into us, into our lives. We are Andrew. We are the bride. We are the centurion. Jesus invites us into his company, into a holy communion with him. Jesus makes an offer we can’t refuse.